"The most beautiful sound I ever heard"
The pregnant mothers included former Planned Parenthood employees Abby Johnson and Patricia Sandoval. Photo: Jose Luis Aguire/Walk for Life West Coast. 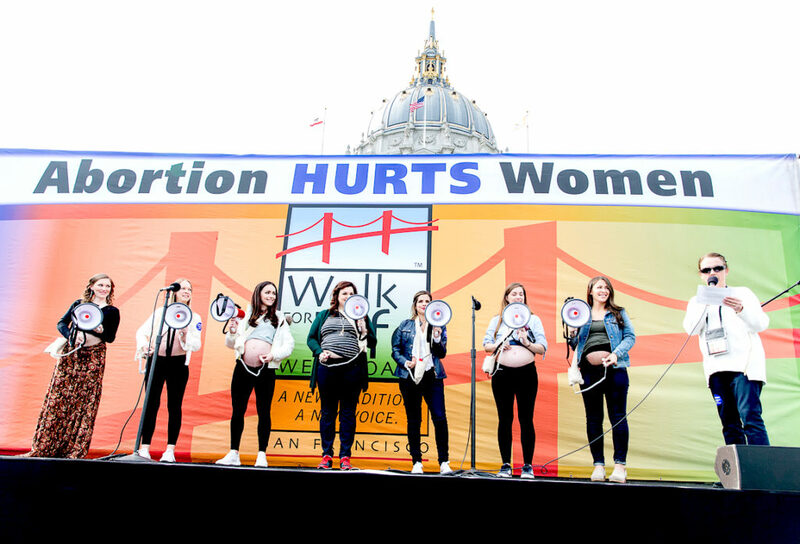 In what will go down as the most memorable moment in the history of the Walk for Life West Coast, seven pregnant women and their unborn children ascended the stage, put microphones to their bellies, and filled San Francisco’s Civic Center Plaza with sounds of tiny heartbeats. The heartbeats were a repudiation of the Culture of Death, exemplified by the state of New York’s legalization of the murder of such children up to the moment of birth. 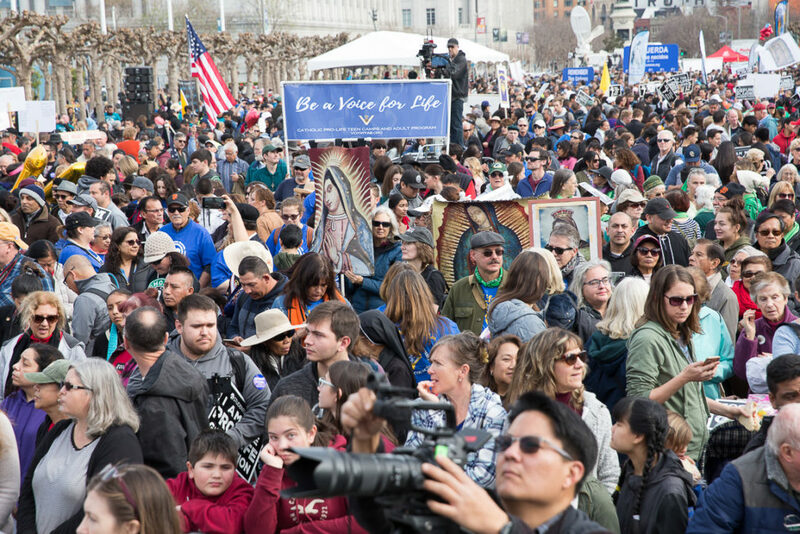 The heartbeats brought an unprecedented response from the tens of thousands of pro-lifers who overflowed the plaza, and even shook the organizers. “I had tears in my eyes,” said Walk for Life co-chair Eva Muntean. Photographs showing some attendees wiping their eyes, while others were moved to elation. The online comments about the experience included “amazing”…”awesome”… “beautiful”… ”fantastic,” and “Fue el sonido más hermoso que escuche” (“The most beautiful sound I ever heard”). The day began with Mass celebrated by Archbishop Salvatore Cordileone at St. Mary’s Cathedral. He was joined by ten fellow bishops, and many priests. The Mass was one of a number of Masses which qualified for a plenary indulgence decreed by the Vatican. This is the first time such an indulgence had been decreed. The archbishop imparted a papal blessing from Pope Francis on those in attendance. Archbishop Cordileone gave the invocation opening the Walk for Life rally. Two of the pregnant mothers were speakers at the rally: former Planned Parenthood employees Abby Johnson and Patricia Sandoval. Both women walked away from their jobs at Planned Parenthood and are now among the most articulate pro-life advocates in the country. Johnson’s first book, Unplanned, has been made into a motion picture to be released this March. The local CBS affiliate KPIX estimated the crowd at 50,000. 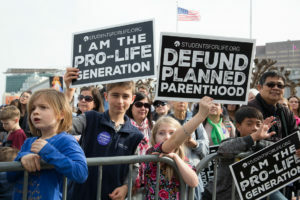 Photo: Jose Luis Aguire/Walk for Life West Coast. Walk co-chair Dolores Meehan presented the St. Gianna Molla award to pro-life heroism to Mrs. Chastidy Ronan, former executive director of San Francisco’s Alpha Pregnancy Center. Meehan recalled how she had first met Chastidy at a fundraiser in a church basement and how she was won over by her warmth, humor, and commitment to helping women in need. A cancer sufferer, Chastidy told the story of how she came to Alpha as a troubled young mother, became a volunteer and the center’s executive director. The “little fundaisers” are now held in the event center of San Francisco’s St. Mary’s Cathedral. At 1:30 walkers left the Civic Center Plaza to head down Market Street to the Ferry Building. The local CBS affiliate KPIX estimated the crowd at 50,000. Counter-protestors this year were the smallest number ever, no more than 25-30 people. Walkers came from all over the western United States and as far away as Colorado, Wyoming, Nebraska, and even the island of Fiji. Students For Life groups from UC Berkeley, UC Davis, San Jose State, and Stanford (among others) came plus Catholic colleges including Wyoming Catholic College and Thomas Aquinas College, who sent over 200 students. . But certainly this Walk for Life West Coast will be remembered for the tiny heartbeats. Photo: Jose Luis Aguire/Walk for Life West Coast. Who cares? Did you miss the point there? No, but you might have missed mine. This was a beautiful, if incomplete, presentation. The pro-abortion lobby relies on a fictional premise: pregnancy and birth are exclusively a “woman’s issue” and a woman’s “choice.” Singling out women is the premise which supports their “control over their own bodies” which is the engine driving abortion. Of course the reality is different. As the church teaches, the family is a Trinitarian reality: Father Mother Child – this is God’s Design for the family. And biologically also all are required. Women do not make babies all by themselves and cannot make a family on their own. They have no right to “decide choice” all by themselves. It takes the family. You make a good point. The dads were mostly taking care of their other kids. It would be great to have dads up there too – hopefully next time. Unless the Wlak for Life marches into the offices of Nancy Pelosi, a self-described pro-abort Catholic under the authority of Abp Cordeleone, there will be no change, just annual Walks for Life. They should have patched the heartbeats through to Nancy Pelosi’s office. I doubt that it would change her actions, but it would convict her conscience. What a powerful statement made by those beautiful pre-born babies. I was at the cable car turntable during the entire Walk. I agree that the number of protesters was minimal. I estimated about the same number as reported in the story. Reconfiguration of the turntable area helped and so did the huge police presence. But where were all the at least nominally pro-life and Catholic people who might have at least gone to stand along Market Street to watch the Walk, to support with applause, and, also, to protect the Walkers? How did they get the heartbeats so synchronized? Does anyone know? Only God knows! Those were live. It does seem amazing that the babies’ hearts all beat at the same time, or at least it sounded as if they did.